I adore strawberries. I think it's one of those fruits that's right on the top of most peoples "favorite fruit" lists. Red and juicy, they just scream summer to me. I can sit and eat a bowl full plain, just chopped up and naked. I've been known to sprinkle a little confectioners sugar over them and throw them over ice cream. I chop them up finely and add them into yogurt. I've picked them by the bushel full and canned up jars of jam. One of my most favorite ways to eat them is in a scrumptious dessert and this one certainly qualifies. 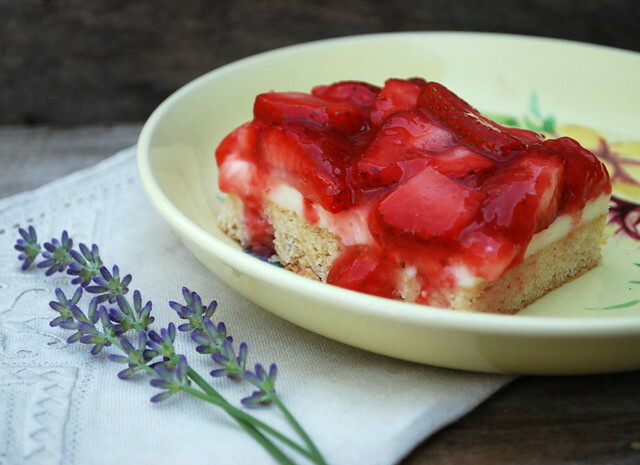 A shortbread cookie on the bottom.....a layer of cream cheese and white chocolate in the middle, topped with crushed and sliced strawberries in a sweet juicy jam sauce. It just doesn't get much better. I served this for Father's Day. I had to hurry and cut out a slice to photograph before it was all gone. Don't over bake your sugar cookie layer. Take it out just as it starts to turn slightly light golden brown or your cookie will be too hard to cut. I've learned this little trick from experience. You could turn this into a red, white and blue dessert by adding in a few blueberries. 1 cup white vanilla baking chips (6oz) - I could not find a package of chips that specified that they were vanilla. I used Ghiradelli white chips. In a small microwavable bowl, microwave the baking chips uncovered on high 45 to 60 seconds or until chips are melted and can be stirred smooth. In a medium bowl, beat the cream cheese with an electric mixer on medium speed until smooth. Stir in the melted chips and blend. Spread the mixture over the cooled crust. Refrigerate while making topping. In a small bowl crush 1 cup of the strawberries. In a 2 quart saucepan, mix the sugar and cornstarch. Stir in the crushed strawberries and 1/3 cup of water. Cook over medium heat, stirring constantly, until mixture boils and thickens. It should be like a really thick jam. Stir in food coloring if desired. I thought I would skip this step, but the color of the berries when they were cooked was a really pale pink, so I added in just a few drop of red to perk it up. Gently stir in the remaining 3 cups of strawberries. Spoon topping over filling. Refrigerate 1 hour or until set. Serve within 4 hours. I have no idea how they came up with the 4 hour time limit, but I suppose the berries would start to make the bottom a bit soggy. Store leftovers in fridge. Your pictures are always so pretty, Lisa! These look wonderful - strawberries, cream and sugar cookie is a combo like chocolate and peanut butter - perfect! Thanks for sharing this - I've got it bookmarked for a few parties we have over the summer. Oh my God how good it looks and i`m sure that is delicious. I think that it is not a very difficult recipe so i will give it a try. Thanks a lot for sharing. Well, you know how we all feel about strawberries over here. And with added cream cheese/white chocolate? If I made this, Trevor's head might explode from pure joy. A beautiful photo of my favorite berry! 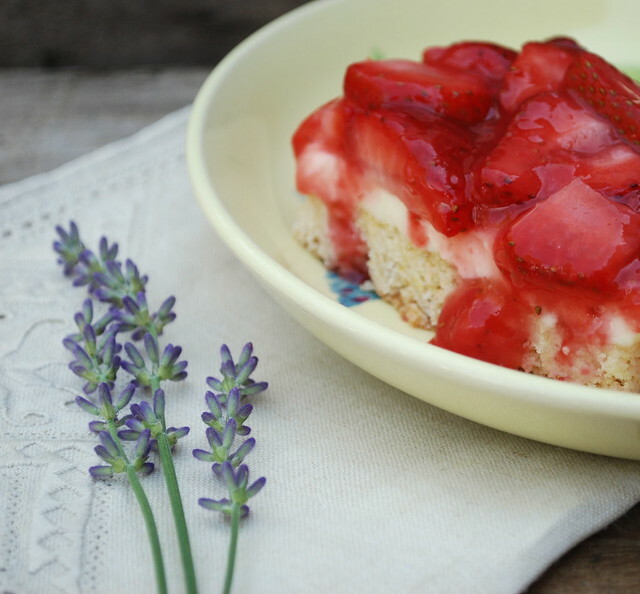 I love anything strawberry, so this dessert is really calling my name. Wow this looks so easy and refreshing. Perfect for a fourth of July BBQ. Mmmm looks so delicious! I will definitely have to try this one. I am SO MAD strawberry season is over here and I didn't make one darn jar of jam. We did however eat them by the handfuls and did make a yummy strawberry sauce like you have here to have over ice cream and pound cake. MMMMMMM. Blueberries are in the market now!! 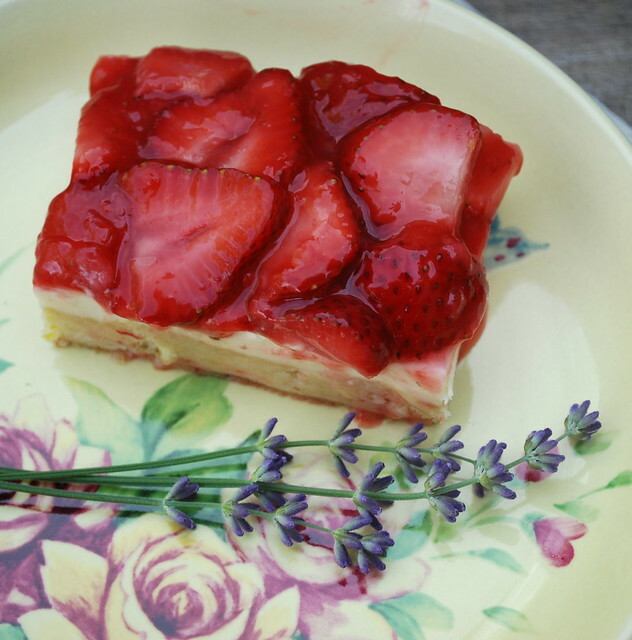 Your beautiful photos make me want a piece... or two right now! So delicious. I pinned this so I can make it this summer. Thanks!